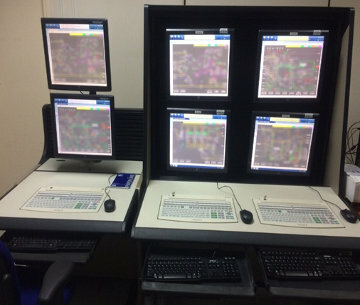 These are the same automation and safety systems used with the actual liquefaction trains, with identical control response, graphics, and alarm behavior. This enables high fidelity modeling of the LNG liquefaction process and closely matches the behavior and operational environment of the actual liquefaction trains. This solution allows plant upsets and equipment malfunctions to be simulated in an environment that is identical to that at the actual plants, allowing operators to develop the skills needed to efficiently handle plant processes and deal with emergencies. The OTS that Yokogawa delivered to OLNG replaced a 15 year old OTS that had been used for operator training and certification. The Yokogawa OTS solution has helped the OLNG trainers and operators overcome the shortcomings of the old OTS, which had a limited number of standard malfunctions and insufficient tag space. There were also shortcomings in the compressor and gas turbine logic because the system did not closely mimic the behavior and environment of the actual plant. After an intensive investigation that took into consideration the existing training challenges at OLNG, Yokogawa drew on its vast experience in the industry to address this customer’s training requirements by proposing a direct connect solution that had the added scope of machinery and utilities. With its quality oriented approach, Yokogawa delivered an OTS solution that was able to reduce operational errors and achieve plant operational excellence. The delivered model was comprehensively tested against the plant historian data on the critical process dynamics of Air Products and Chemicals, Inc., main cryogenic heat exchanger (MCHE), and the fractionation sections, and was verified against licensor data. All frequently experienced process upsets and operator recovery procedures were tested to achieve the dynamic accuracy and fidelity needed for critical LNG processes. As a part of its deliverables, Yokogawa has committed to a lifecycle program for a 10 year period, during which time it will strive to maximize ROI and the value contributed by the training simulator. Over the course of this program, Yokogawa will keep the delivered OTS up to date and seek to minimize system downtime. "It is not always essential to spend large sums on a solution; customers also look for an optimized and skilled engineering approach." "The behavior and fidelity of the model are very close to the live plant."